Debbie Stier was worried about her son Ethan’s lackadaisical attitude towards school and became frustrated when the public school he was attending thought it was acceptable. Since Ethan was in high school she knew something had to be done or he wouldn’t get into the college of his choice. She didn’t have the money to put him through school and decided he needed to earn a scholarship as well. She enrolled him in a private school and then she set out to earn a perfect score on the SAT. She figured she’d know how to help Ethan prepare for the test once she’d managed to conquer it. 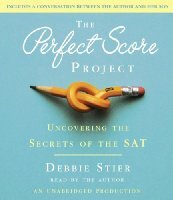 She chronicles her year of test taking in The Perfect Score Project: Uncovering the Secrets of the SAT. Debbie Stier is one intense woman! Once she decides to do something, she is all in, so she became obsessed with the SAT while she worked on this project. She read all she could about it and decided to test different variables. She also tested many of the SAT prep methods and courses out there, giving feedback on each one. I did think some of her feedback was flawed because the results of the test prep were cumulative – she didn’t “unlearn” what she learned from previous courses. I did appreciate the fact that Stier was willing to jump right in and do what she expected her son to do but I found her overbearing at times. She did learn a lot about the SAT and, if you or a child will be taking the test soon, you can probably learn quite a bit about the test from this book. After reading the book, I feel like the SAT is pretty meaningless and really serves no purpose other than terrifying students and making money for the College Boards and test prep companies. Speaking of test prep companies, I had no idea there are so many of them out there! It almost made me feel like I was a bad mother because I did absolutely nothing when Vance took the ACT. He was totally on his own and, after reading The Perfect Score Project, I think he was in the minority. I never realized people start preparing their kids for these tests YEARS in advance. In the end, I liked this book, but didn’t love it. I’m not really the target audience for it, though, and I think readers with high school aged children will probably like it more than I did. I did talk about it quite a bit as I read it so it would probably make a great book club choice. The audio version is narrated by the author and she does an okay job. The audio is on 8 CDs and lasts approximately 9 hours. Hi….No need to feel sorry for my son! Not sure when you went to took the SAT, but the stakes are a lot higher now than when I took the test in high school back in 1982. The economy we live in today has created an entirely new landscape. I wanted my son to have every opportunity possible to be a viable candidate in the work force. Reading excerpts and reviews of this books makes me glad my kids are past this stage!! This goes over my head but I can imagine the tenacity of this woman. With my oldest I was in the dark about test prep but her school offered it at no extra cost to parents. I had a better idea with the next two kids on what they needed (or didn’t need) to prepare. Like lakesidemusing, I’m very glad to be past that stage of parenthood, lol. Kathryn, you comment about not being the right audience for the book. And that may have influenced your opinion of it. That brings up a question that I’m not sure how to answer. I have read a couple of YA books with teenage girls as the protagonists that I absolutely loved. I’m pretty sure, as a 64-year old man, that I’m not the target audience for those books. But I cared about the characters probably as much as female teenage readers did. I don’t know. It seems that it’s how the book is written more so than who the target audience is that makes the difference. Or maybe I’ve got the mind of a teenage girl! I absolutely hated the SAT and I took it many years ago. It seems it only has gotten worse. I have a copy of the book but haven’t read it yet. I get the feeling I’ll enjoy it even though I don’t have any high school age kids to prepare. This book sounds like a valuable resource for college-bound students. The amount of testing students undergo is intense. I should probably check this one out. It sounds interesting but I admit that I’m terrified that I’m not doing enough since Booking Daughter is a freshman. I am kind of leaning towards letting her fend for herself but then I feel guilty. I never had to do the SAT, but I did take the GRE exams, and that is one thing I was thrilled to have behind me. I would love to read this book just to see how the project worked but not sure much of the SAT thing will get past my head. I remember hearing about this one and thinking what an incredibly dedicated mom to have gone through all that. And also thanking my lucky stars that my kids are already in college, doing great and we are past the SAT. Woohoo! Those kinds of test cause a lot of stress. Thanks for your interesting review Kathy. These tests are so stressful. I had my son take the pre-SAT twice and the ACT as well. At the end of the day, no one remembers what scores they got on these tests. It really is over rated I think. And some kids don’t test well, but are very intelligent. I have a hs freshman and we haven’t focused on SAT prep yet. The book sounds informative, though intense! Some moms are so much more tenacious than I am – and this is in no way a criticism. I think there are plusses and minuses to whatever way we raise our kids and as a parent, you are the one who knows best for your kid.